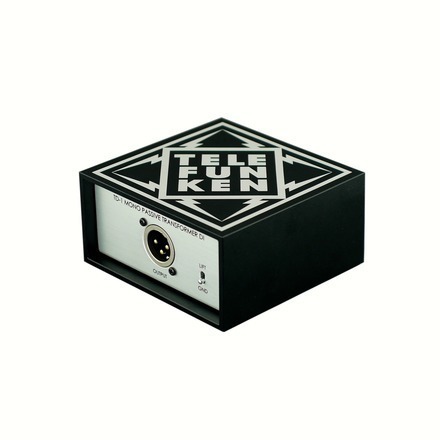 The Telefunken TDP-1 (mono unit) and TDP-2 (dual unit) are new passive direct box designs that combine premium quality components with a rugged construction to create a reliable DI with rich, warm tone. Utilizing an OEP/Carnhill transformer made in the UK, mated with a simple "less is best" design approach, the Telefunken passive DI's provide superior vibe and character to best complement the natural tone and feel of your instrument. The circuit is housed in an extremely durable extruded aluminum enclosure with recessed switches and connectors. This rugged construction is virtually indestructible, able to easily withstand the wear and tear of gigging. Each channel features two heavy duty metal toggle switches to engage a -15 dB pad and ground lift. The TD-2 unit features two independent DI channels with separate controls, giving you the ability to run two instruments through one footprint on stage or in the studio.